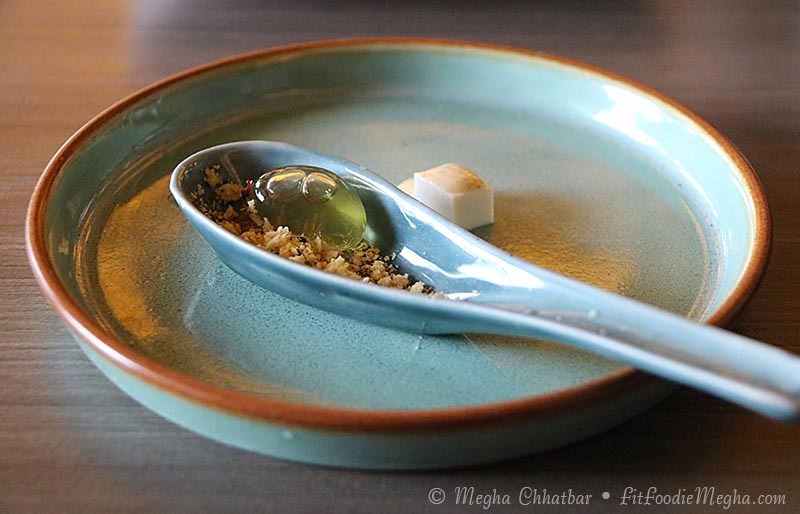 Fit Foodie Megha: Limitless Lunches at Gong – Reviewed! I love Asian Cuisine and recently so many places are contributing to the progressive culinary experience. One of such places is Gong which is located in fast developing area of Baner Balewadi High Street also known as BHS. My first visit to this GONG was fantastic and my experience, the ambience and the details of the food, I had, can be read here. 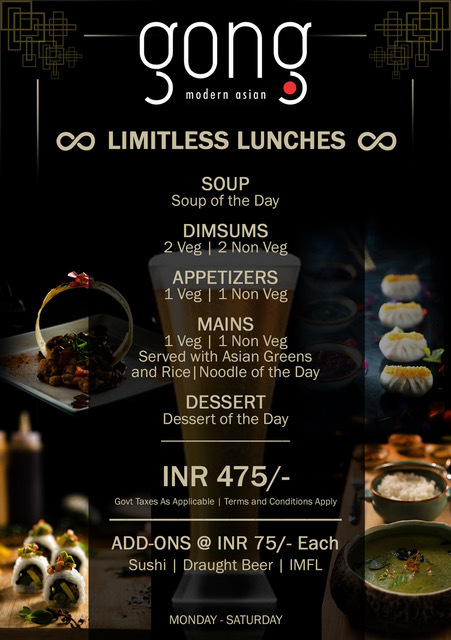 With so many corporate companies and residences around, recently, Gong has started 5-course Limitless Lunches at a stealing price of Rs.475 plus taxes and apart from that you can also add Sushi or Draught Beer or IMFL at Rs.75 each. I was invited for the lunch hence tried the set menu of the day. From the set menu, first was the Soup of the Day. We had Tom Yum Veg Soup which had all basic Thai vegetables and spices like Lemongrass, Galangal, Kaffir Lime, Tomato, Carrots, and Bok Choy. Bit of oily but had all the flavours. Second course had Dimsums! And you get two varieties of it. So, first we tried Veg basil Dumplings which were flavourful and nicely cooked. Very finely chopped cabbage, carrots, zucchini, peppers are wok tossed and filled to make a scrumptious dumpling. These dumplings had very mild flavour of basil though. Another choice was the Cottage Cheese Ravioli. 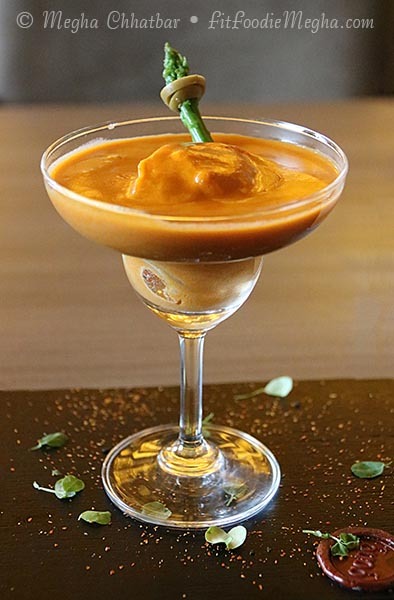 The Asian Cottage Cheese Ravioli served in the margarita glass was a flavour bomb. However it had very less amount of cottage cheese! Cottage cheese filled ravioli into thick coconut milk gravy was delish. The rich, creamy, curry with a strong aroma and flavour of coconut was the highlight for me. Next course was the appetizers. You can choose any one hence we tried Cottage and Sudried Tomato Buns. I personally liked the buns, they were light and fluffy with a crunchy, sweet, spicy, tangy deep fried and sauteed cottage cheese. One portion may vary from 2 to 6 buns per serving. For the mains we tried Green Curry Vegetables with Asian Greens and Burnt Garlic Rice. Green Thai Curry had the predominated flavour of coconut, which I liked. I am not a fan of Asian Greens so gave it a skip. Burnt Garlic Rice was the star dish of the day. It was so flavourful that you could eat it like that only. Though, I was not very much happy with the service and the mocktails but overall, Limitless Lunches is a fantastic deal.